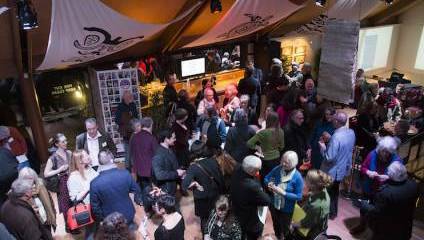 One of the top poetry festivals in the UK, StAnza is famous for its friendly atmosphere and international focus, the place to hear favourite poets, discover new voices and enjoy the beautiful town of St Andrews and StAnza’s lively festival hub. Choose from more than 80 readings, performances, discussions, drama, poetry inspired installations and exhibitions and other cross-media performances in a range of atmospheric venues in and around the historic and lively town centre. Take part in a wide range of workshops, a masterclass and open mic events, or just sit and enjoy the lively festival scene with a coffee or drink. Imtiaz Dharker, Caroline Bird, A.E. Stallings, Jacqueline Saphra, Liz Berry, Gerda Stevenson, Alan Spence and George Mario Angel Quintero are among the headliners for 2019 and this year’s spoken word at the festival features Carly Brown, Joe with the Glasses, Tolu Agbelusi, Ben Norris and Harry Baker. This year’s themes are Off the Page and Another Place, and The Mediterranean and Beyond is our translated language focus. Tickets now on sale with concessions and bulk purchase discounts, and there are many free events. Book your ticket now!